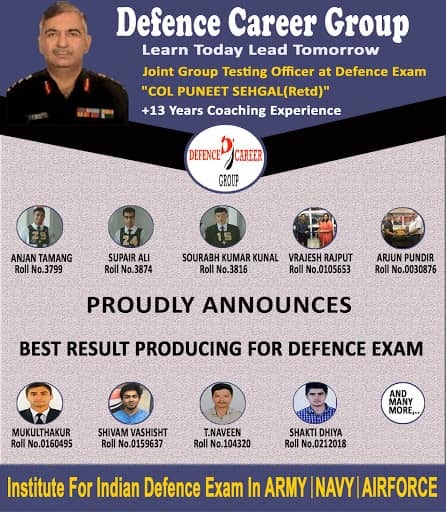 Defence Career Group was established as a top ranking institute in the Delhi, solely with the aim of providing Defence coaching for Defence lovers. Students achieve their goal to work with the most prestigious sector. DCG motivate the candidates in clearing Defence exams by providing the highest quality coaching from well qualified and experienced teachers. The method, content and teaching standards established by the DCG have become synonymous with success in the minds of candidates. OUR Performance: Our total job selections in defence is 90% and the top positions have been achieved by our students in NDA, Air Force, Navy, CDS, OTA, DELHI POLICE, Asst. COMMANDMENT etc. consistently. As regards the past achievements, the DCG team has been pushing forward students with excellent teaching & guidance and ensuring a promising career in the Indian armed forces, paramilitary forces and police etc. Pilot Officer, Flying Officer, Flight Lieutenant, Squadron Leader, Wing Commander, Group Captain, Air Commodore, Air Vice-Marshal, Air Marshal, Air Chief Marshal… One day you`ll have those wonderful letters before your name. DCG is the only institute who deals with best quality coaching facility and self-prepared up to date study material. We provide the students healthy environment to study and to live in a hostel. We are serving with two institutions at Delhi and Chandigarh. Students from all part of the country can join our either institute. We provide hostel facility at very nominal charges.